(Jakarta, September 12th 2013) – Celebrating the beginning of construction for Archipelago International's anticipated five-star Lombok villa resort, Thursday 29th August 2013 saw the groundbreaking ceremony for the Royal Kamuela Villas – Senggigi, Lombok. To commemorate the start of this exciting new project, the ceremonial event was attended by Archipelago's senior management, as well as representatives from the Singapore-based developer, Latitude 8. 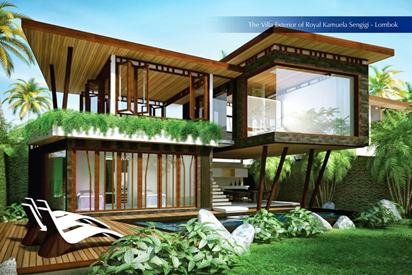 Expected to open in January 2015, the villas will enjoy an address that is both convenient and idyllic. Centered around the well-developed township of Senggigi and fringed by a series of wide bays that greet blue seas and stunning beaches, Royal Kamuela Villas – Senggigi, Lombok teeters along the picture-perfect 30km coastal strip of West Lombok. Soaking up the beachfront vista, the villa resort will cover 3.5 hectares of coastal land, embraced by a panorama of the glimmering ocean meeting Lombok's enchanting hillside. The resort will feature 43 one-bedroom villas and 7 two-bedroom villas, each one boasting a private pool and open-plan living spaces. Envisioned by Archipelago International – one of South-East Asia's leading and most respected hospitality management companies – the villa resort satisfies the most demanding international standards for luxury boutique resort accommodations, and therefore provides a wealth of befitting amenities. Business travelers can enjoy the privacy and comfort of the cool living-room style library, suitable for intimate meetings in conjunction with the stylish Business Centre. Meanwhile, leisure travelers are well-catered for with the sensual spa and fully-equipped fitness centre, complimented by the resort's expansive swimming pool. Surrounded by reflecting ponds, a signature restaurant will glitter with an al-fresco feel, seamlessly leading to the resort's elegant Beach Club & Lounge. "Lombok is continually becoming a welcomed alternative to Bali, attracting travelers from across Asia and beyond with the promise of a more secluded, undisturbed getaway. Hence, we are extremely confident about the latest Royal Kamuela, bringing a new level of luxury to this up-and-coming island. In light of this optimistic outlook, we have in fact already entered into agreements to manage three more properties, as well as beginning further talks with other owners and developers to evolve this luxurious brand" says Aston International’s Vice President of Sales & Marketing, Mr. Norbert Vas. Poised as an international standard 5-star beachfront resort, the new Royal Kamuela Villas will be a welcomed addition to the already-famous Royal Kamuela Ubud – Monkey Forest. By combining exquisite attention to detail with impressive architecture and a nature-inspired design, Royal Kamuela Villas – Senggigi, Lombok introduces a unique and luxurious accommodation choice to Western Lombok's breathtaking shoreline. Archipelago International (formerly known as Aston International) is one of Indonesia’s leading hotel operators with an underlying portfolio of more than 60 hotels and 12,000 rooms. As a continually expanding brand, Archipelago International has a development pipeline exceeding 90 properties in Indonesia, the Philippines and Malaysia.